Sysbrain is a cognitive software agent written especially for satellites, to help them act autonomously while in orbit. Sysbrain even allows satellites to go out on the human Internet and read English-language technical documents and receive instruction on subjects like identifying and avoiding obstacles. 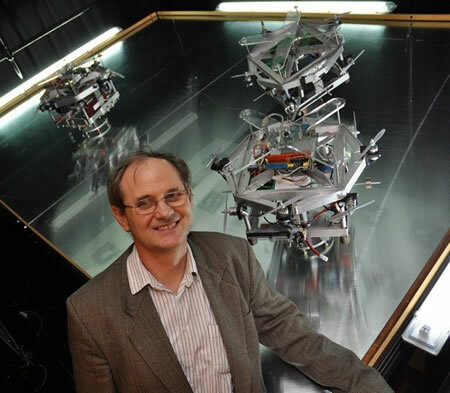 To test the control systems that could be applied in a space environment, Professor Veres and his team constructed a unique test facility and a fleet of satellite models, which are controlled by the sysbrain cognitive agent control system. The ‘Autonomous Systems Testbed’ consists of a glass covered precision level table, surrounded by a metal framework, which is used to mount overhead visual markers, observation cameras and isolation curtains to prevent any external light sources interfering with experimentation. Visual navigation is performed using onboard cameras to observe the overhead marker system located above the test area. This replicates how spacecraft would use points in the solar system to determine their orientation. The perfectly-balanced model satellites, which rotate around a pivot point with mechanical properties similar to real satellites, are placed on the table and glide across it on roller bearings almost without friction to mimic the zero-gravity properties of space. Each model has eight propellers to control movement, a set of inertia sensors and additional cameras to be ‘spatially aware’ and to ‘see’ each other. The model’s skeletal robot frame also allows various forms of hardware to be fitted and experimented with. I was trying to think of examples of satellites thinking for themselves, which should strike you as a fair topic for science fictional treatment. 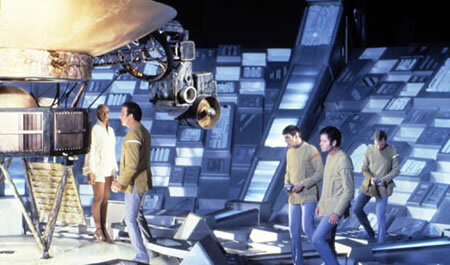 For example, the first Star Trek movie contained Vger, which had been reprogrammed and enhanced in an alien encounter (if I remember correctly). 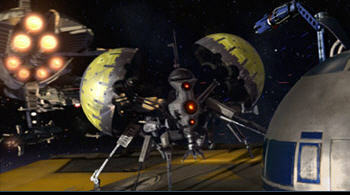 V;ger was not strictly speaking a satellite, but rather an explorational vehicle, but it's close. Perhaps readers can think of other examples. From University of Southampton press releasevia our friends at Frolix_8.